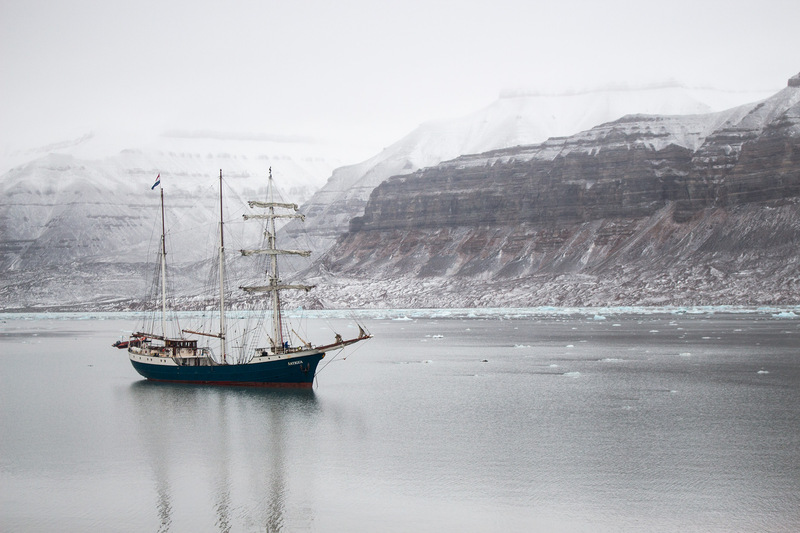 After having landed at Bjonahamna we took up the anchor and started sailing down the fjord towards Tunabreen – a glacier. Many of us had caught sight of the glacier in the distance whilst we had been on deck at Bjonahamna and had already been wondering whether that might be our next stop. 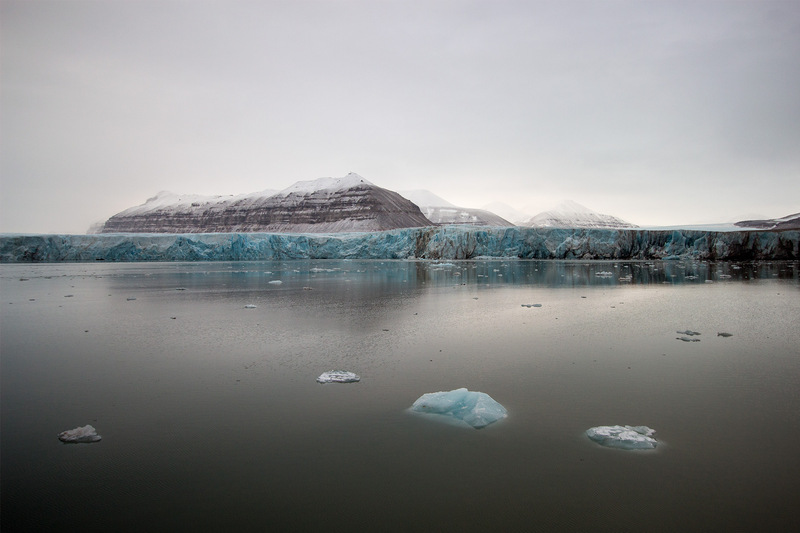 As the ship approached the glacier the water around us started to become matted with ice. If I understood correctly then this was ice that had calved from the glacier but had yet to be carried out of the fjord by the winds – rather than being sea ice. This ice caused the ship to slow right down. The second mate climbed out onto the bow of the ship in order to aid the captain in navigating through the ice and avoid any collisions with larger pieces of ice as we all stood on deck in awe of our surrounding. Our first encounter with a glacier was utterly overwhelming – photographs and videos just can’t capture the grandeur of the glaciers. The first thing that struck me about the glaciers was their colour. They are blue. An iridescent blue. An unreal surreal blue. Second to that is their scale. It’s difficult to convey the scale of the glaciers in photographs – the landscape is so barren that there are no trees, animals, or even buildings, to give us a sense of scale. As with many glaciers Tunabreen had dark stripes down the face of it. 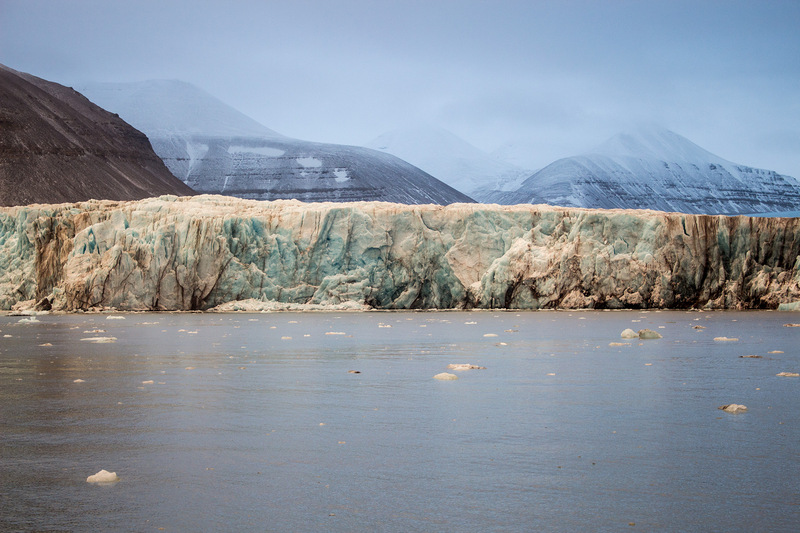 These are the result of the moraine being caught up in the ice when two glaciers have come together. Whilst exploring the area around Tunabreen we encountered the results of climate change first hand. After having anchored we were dropped off on the coast near the glacier so that we could set about our exploration. However, much to the surprise of our guides, it turned out that the earth we had landed on had become an island since the guides had been here last. The glacier had retreated so much that there was clear water between the glacier on the new island on which we had landed! We ended up anchoring at Tunabreen for the night which meant that we had plenty of time to take in our surroundings here… as well as the wildlife – whilst we were here we saw a pod of beluga whales swimming around the fjord close to the shoreline. They were bright white against the water as they gracefully weaved their way through the water. It was a magical sight! As we stood out on deck at night the glacier could be heard calving in the darkness. Every now and again we would feel the boat rock as the calving sent out a wave as the ice crashed into the water. Spending the night on anchor here meant that we had an opportunity for two landings at this site by Tunabreen. I had spent the first landing absorbing my surroundings and trying to capture something of the experience in my sketchbook. 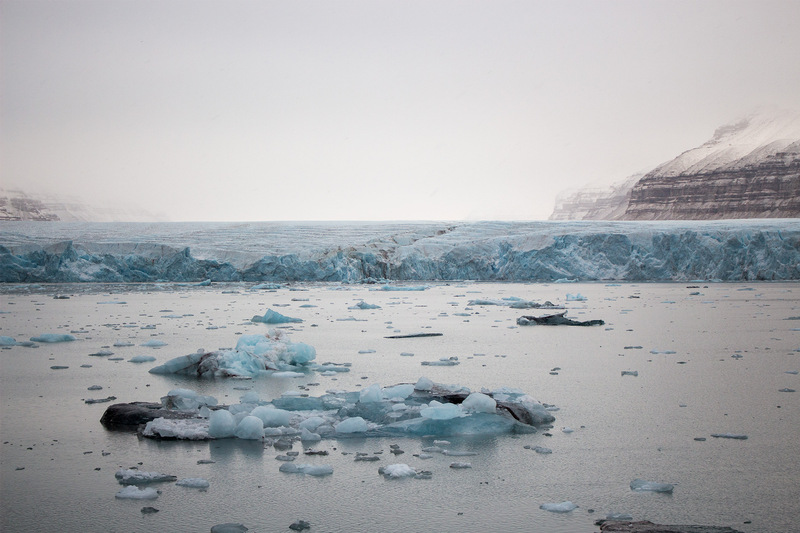 The coastline near Tunabreen was littered with pieces of crystal clear ice that had been calved from the glacier. Some of these were the size of my fist whilst some were big enough to sit on! On finding out that we would be headed back to the same site the following morning I decided that I would see if I could make use of the washed up ice in order to make a glove puppet. As you can see from the short clip above the ice worked well as a head for a puppet. Unfortunately this was the only puppet clip I shot during the residency which is a shame really as the backdrop is mind-mindbogglingly breathtaking… perhaps this a perfect excuse to head back out to the arctic though – to finish what I started with this puppet!